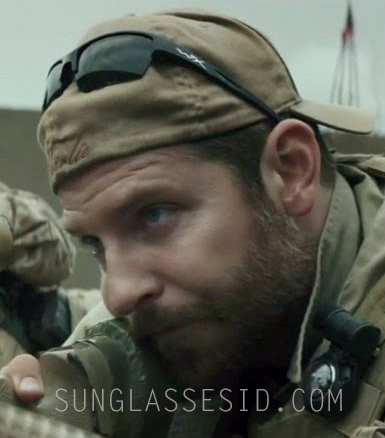 Bradley Cooper wears Wiley X sunglasses in American Sniper. Bradley Cooper wears Wiley X sunglasses in American Sniper (2014). The glasses look like the Saint model (see it here). American Sniper is a war drama directed by Clint Eastwood, based on Chris Kyle's autobiography American Sniper: The Autobiography of the Most Lethal Sniper in U.S. Military History. With 255 kills, 160 of which were officially confirmed by the Department of Defense, Kyle is the deadliest marksman in U.S. military history. His widow Taya Renae Kyle was heavily involved with the making of the film. The film stars Bradley Cooper and Sienna Miller with Luke Grimes, Kyle Gallner, Sam Jaeger, Jake McDorman, and Cory Hardrict in supporting roles. Bradley Cooper wears a Casio G-Shock DW6600 watch in the film.